Maxine Beneba Clarke is an Australian writer and slam poet champion of Afro-Caribbean descent. In 2015, she was named one of Sydney Morning Herald’s Best Young Novelists of the year. She lives in Australia. Van Thanh Rudd is an Australian street artist and activist who studied at the Victorian College of the Arts, RMIT University, and Griffith University. 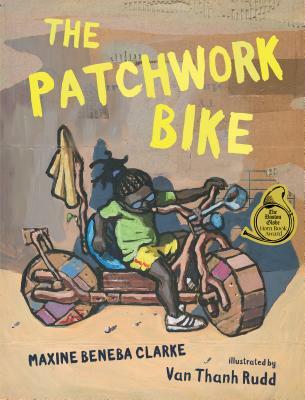 The Patchwork Bike is his first picture book. He lives in Melbourne with his family. Clarke’s poetically compressed language hurtles joyfully along, while Rudd’s illustrations, made on cardboard boxes with spirited swaths of paint, burst with irrepressible life. Dreaming and building, we see, go hand in hand no matter where you live. The dark, bright, and desert hues create a blazing-hot world readers can almost step right into. Showcasing the fun to be had in a spare world, this book is just what many of us need right now. In her picture book debut, Clarke’s lines sing with sound and rhythm, evoking the “shicketty shake” sound of the bike on sand hills. Street artist Rudd’s textured paint-and-cardboard collages create a strong sense of a place (the blaze and shadow of the desert) and the people who live there...Without minimizing the clear references to economic and racial struggle, the words and images in this snapshot story pulse with resourceful ingenuity, joyful exuberance, and layered meanings. There are small mysteries and deep shadows, figurative as well as literal, that stretch among Rudd’s provocative paint-on-corrugated packing box illustrations in this Australian import...With every visual detail a poignant counterpoint to the simple storyline, there are depths here for older children to plumb. The story by itself is superb, but the artwork elevates it further. Rudd’s street art approach is raw yet refined as nearly every brushstroke is visible on the repurposed cardboard backgrounds. Much like Javaka Steptoe’s Radiant Child or Jane Yolen’s What To Do with a Box, the format shows the incredible creativity of young minds combined with the constraints of poverty...An excellent story and conversation starter. Clarke’s spare, mellifluous language dances across the pages, full of vivid imagery and hyphenated turns of poetry (“out in the no-go desert, under the stretching-out sky”), all of it hand- lettered on Rudd’s rough, tactile paintings...These illustration choices reflect the book’s very theme—exposing the harsh reality of life that some people face while acknowledging the resilience that comes from homemade joy. The notes at the end of the book from both the author and illustrator add context and take the reader outside the story into broader themes of the world beyond, including the Black Lives Matter and Occupy Wall Street movements, making this simple yet joyous picture book a potential springboard for discussion, inquiry, and research. Told in free verse from the perspective of a young female narrator, this story speaks to the spirit of children, play, and makers everywhere. Words hum with catchy musicality on edgy acrylic-on-cardboard art that parallels the bouncy story line and makes powerful political points as well...Neither heavy-handed nor Pollyanna, this timely book honors the power of imagination to discover possibility amid hardship. This winning book will make a great read-aloud for primary grades and provides great material for discussions about creativity, the power of play and imagination, and how to best be happy with what you already have. The vivid rhythms of Clark's buoyant prose...are perfectly matched by the bold lines and vivid splashes of color of street artist Van Thanh Rudd's marvelous illustrations in this delightful, exuberant, entirely original picture book. It’s so incredibly beautiful and the art is magnificent. Vibrant, energetic, and wildly original! Who wouldn’t love those imaginative kids . . . and their weary mom? Kids having fun. Being silly. Being adventurous. Having the times of their lives. This book exudes that very joy. It alludes to police brutality, economic disparities, and the Black Lives Matter movement while at the same time showing children having a great time thanks to their own devices. Bold, beautiful acrylic paintings atop recycled cardboard. This is the sort of book that wows you from the front cover on.